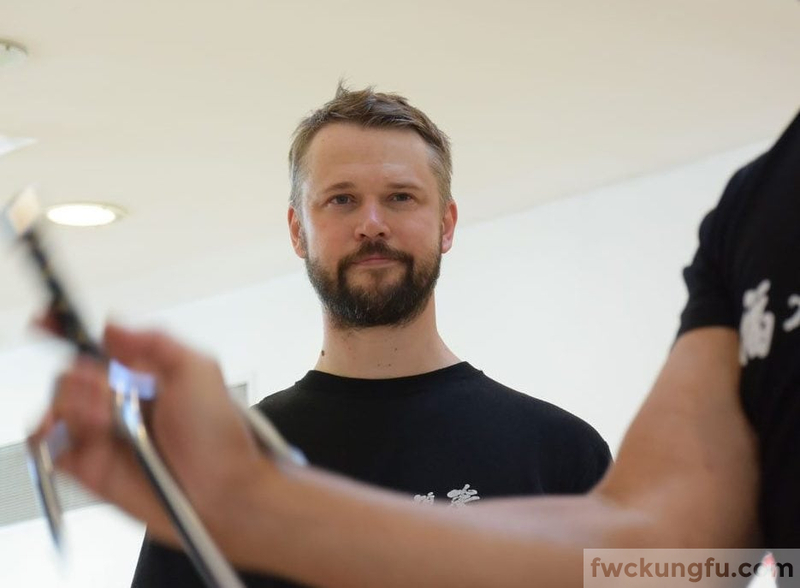 “I have practised White Crane Kung Fu for over twenty years, martial arts of any type for over thirty. In fact, my first memory from when I was around four years old is of my father teaching me how to punch correctly and making me do sit ups (the kind where I had to write my name with my legs in the air, stomach muscles straining! So, when I make you do the same in class, dear students, remember, it comes out of love…). 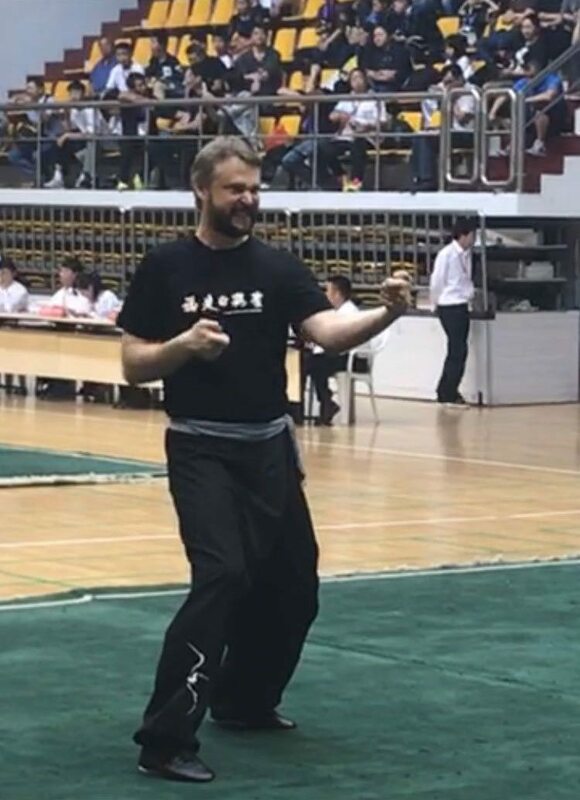 Danil competing in China, 2016. Over the decades my motivation for continuing to invest so much time into my own practice has changed. At first it was a fun exercise to brag about to my friends, then the motivation developed to wanting to be able to handle myself in a fight, then to liking the confidence it gave me as young man in my later teens. In my twenties, I got really interested in Chinese culture and Kung Fu became a core part of how I lived my life. Now, nearing forty, it is even more than that: practice of my patterns for me is a spiritual experience, it is a way for me to feel fulfilled as a human being. So what is Kung Fu that it can meet so many different motivations for me in my life? Only in the West is this term used exclusively for martial arts. The words “Kung Fu” actually translate as “hard work”. In China, a calligrapher with excellent brush-work, or a champion player of the game of Weiqi, is said to possess good Kung Fu, not just a skilled fighter. What connects all these practices is that they require a sustained application of effort over a period of time to master a skill. This meaning of Kung Fu has deep roots in Chinese philosophy. The Philosopher Zhuang Zi (4th century BCE) first wrote about the pursuit of enlightenment through dedicated practice of a skill. The example Zhuang Zi gave was not of a prince or a minister, it was a village butcher, who, after a life-time of work could chop a carcass into pieces without ever blunting his cleaver: every swing of the blade found the perfect space between joints, the edge never getting stuck in the bone. The butcher is fulfilled. He has found his path in life, understood what makes him happy, what makes him tick. He then pursued that path, perfecting his skill and becoming an undisputed master of it. The other villagers knew him for it, it was his essence and he was never happiest than when being a butcher. For Zhuang Zi such practice was about becoming a perfected person, shen ren. He thought this was the ultimate goal of a human being. Take the raw clay of what you have been born with and spend your life creating the most beautiful vessel you can out of it. A shen ren is able to achieve a sense of unity with the Dao, the true nature of reality for the Chinese, not through learning or reading religious texts, but through a physical process that used not just the mind, but the body and the spirit as well. This could be through being a butcher, or a calligrapher, or a martial artist, but the crucial point is that it could not be achieved fast. It takes years for the butcher to train his swing and sharpen his aim, for the calligrapher to perfect the wrist movement that produces the desired brush stroke just so, for the martial artist to do a perfect punch. Mind, body and spirit united. Being in that moment of connection between the self and the world that the butcher achieved, happily chopping away. This is what I feel, as well, when I am deep into my practice of Kung Fu. Indeed, that is why our first pattern, San Zhan, is called Three Wars: unity of mind, body and spirit. It is the simplest pattern to learn but the hardest to perform well precisely because it is so simple. There are no flowery complex sequences to hide your mistakes in. It demands perfection, balance, alignment. It takes a lifetime of practice to get this right and when you do, it is a profound experience. 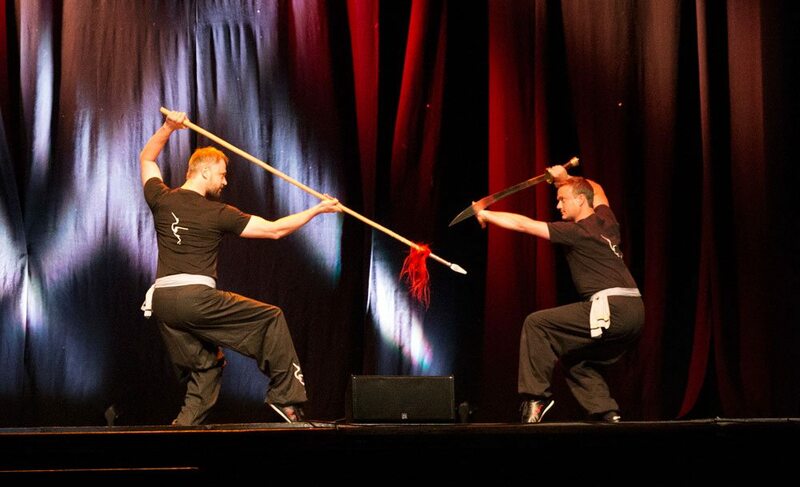 Danil demonstrating spear against broadsword. Only a few times in my life have I felt it, but each of those moments are forever in my memory. One time was when I practised my San Zhan pattern over a thousand times in one continuous 24-hour sequence. Deep into the night with the whole world seemingly asleep around me, I felt my pattern flowing like silk. I no longer felt the tiredness of my limbs, any of the aches or pains. I felt my wife sleeping next door, I felt my neighbours asleep through the walls. The people in the houses around ours. The wind in the trees outside. The moon in the sky. It was joyful.